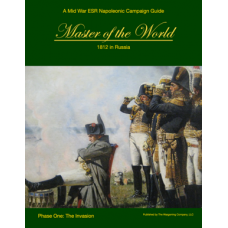 Master of the World 1812 in Russia Campaign Guide Master of the World, 1812 in Russia, Phase One: The InvasionThe 1812 campaign is arguably Napoleon’s most well known campaign and one of the great tragedies of military history. It is also the story of Russia’s First Great Patriotic War, repelling a great invader. In excess of 600,000 soldiers and support personnel crossed the Niemen River from the Grand Duchy of Warsaw into Imperial Russia under the French Imperial flag beginning on 24 June, 1812.Master of the World includes everything you need to begin recreating the first phase of Napoleon’s disastrous 1812 Russian campaign: organization, maps, historical briefings, and uniforms.One campaignNine scenariosTwenty-seven mapsOver 300 uniform platesNearly 200 pagesLet’s start a land war in Asia…Including over 300 uniform plates created especially for inclusion in this series and offering 9 scenarios covering the French main army’s advance to Moscow:MirSaltanovka – Two versions: The Spoiler Attack and Clear the Way to MogilevOstrovnoVitebsk1st KrasneSmolensk – Two versions: Preserve the Army and Save the Holy CityLubinoSchwardinoBorodinoMaster of the World is compatible with Et sans résultat! Original and Second Edition as well as most any other tabletop Napoleonic wargame.Due for release Last Week March.